I am not really into the "new release fever", I basically read what I can set my hands on. However, I bought "When We Speak of Nothing" by Olumide Popoola when I visited Atlantis Books in Santorini. I had no idea who the writer was, however, I know the publishing house Cassava Republic based in Nigeria and I've been longing to read more books published by them, so, coming across this novel was an opportunity. well in her novel. 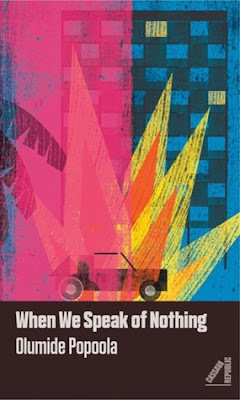 "When We Speak of Nothing" is also about friendship, the relations between Karl and Abu, about injustice: the ecological disaster in the Niger-Delta area perpetrated by multinational oil companies in Nigeria, for more books that expound on this topic please click here. Even, more engagingly, it is a love story of when Karl meets Janoma. Furthermore, I'd like to add that I did not enjoy this novel as much as I thought I would, I guess the reason is because of the prose, which isn't clear and concise enough, sometimes it feels like poetry, which slowed down my reading. Regardless, I find the topic narrated on thought-provoking: gender identity, friendship, injustice, racism and love. I'd like to read more by Olumide, this is her debut novel. Have you read this "When We Speak of Nothing?" Thank you for this review Mary! I actually abandoned this book just last week. I just couldn't get through it. This made me feel better. I understand how you feel, interesting story with a difficult prose.